Did you use any mental training methods in your playing days? 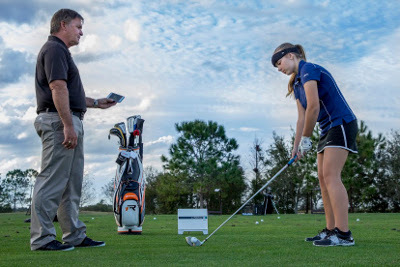 How did you help your students with the mental side of golf BEFORE you started using FocusBand? When I was competing, transcendental meditation and deep breathing exercises were key. It helped me have a zone like experience. I wasn’t automatically going into the zone but I was getting closer to what that was all about. It took me about three shots of hitting it really well and then boom you just drop right in and there you are, you’re feeling it - you’re in that zone experience. Shortly after doing that I had a couple tournament records. I shot 64 at an event. I started playing mindless golf. I didn't know what the term Mushin was at the time but now I do after using FocusBand. The mental side of the game has always been one of three parts of my training and focus with players: technical, tactical and emotional. Before FocusBand, I could teach heart coherence to calm the left brain, and, we used HeartMath’s technology training tools to provide proof they were in this zone, but FocusBand, has been a game changer because students see on the monitor if they are in the green, right brain zone when they are supposed to be, versus in the red, left brain mode. What FocusBand techniques do you recommend for your students? I found a graphic showing the brain and the attributes of each side. When I share this with my students, it provides huge awareness and they immediately respond, “Oh! No wonder I’m having trouble on the golf course. I’m totally getting myself into left brain.” So I tell them to take a look at the attributes of being in right brain, and to tell me what that means in terms of golf. They go on to say that it’s all about being calm, rhythmic, peaceful and focused in the moment. It gives them a big picture of what’s going on upstairs and why they would play their best golf while in the right brain zone. Then from there some of the exercises I do with FocusBand is a basic one that involves putting two golf balls on the ground about a yard apart. I'll have them focus on the ball to the right and put both their intent and focus there. Then I'll tell them that I want them to move their intent to the ball on the left, but to stay focused on the ball on the right. They’ve moved their intent to the left ball and now they have to shift their focus to the left ball. So now both focus and intent are on the left ball. We’ll do this exercise going back and forth – “intent ahead of focus, intent ahead of focus, intent ahead of focus”. We’ll do that for a number of reps until they start to get a feel for it and then we’ll do it with a golf ball placed in their stance and with a chosen target. The beauty of it is that when you have your intent on the target and you’re staring down at the golf ball, you are now locked in and connected. You’re connected to where you are beginning and where you want the ball to go to. Once students understand how to do that, the monitor lights up pure green! Focus on the ball, intent to the target, that’s where the energy and focus needs to be, and then let it rip! Have you had any proven results with students? Yes! Tim Clack, who has been playing on the Golf Channel Amateur Tour for about 4 or 5 years now, has progressed nicely. His scores were continuously dropping to mid to high 70s. Then he hit a wall shooting 86, 85. He went all left brain, thinking way too technical trying to figure things out. He was back in town for an event and we did his first FocusBand session. The next day he shot 77! He was so grateful for FocusBand and how it improved his numbers. He loved the direction that we went and he started to understand how to get himself into that right brain mentality. He realized the mistake that he was making but it took this tool to be able to show him how to do it, and then he immediately went out and started applying it. We only that one session so far, so it can happen quickly. What advice do you have for other instructors interested in using FocusBand but do not know where to start? As a golf instructor you need to be able to teach people how to use their mental faculties to play their best golf. Good technique without mental faculties doesn’t result in good scores. One must go beyond the disciplines of a routine. While a routine is certainly important, routine will be interrupted if the student doesn’t know how to stay in their right brain because they are too analytical about what's happening, judging their performance. Teaching students how to stop being so technical and analytical can begin by simply having them close their eyes. This quiets the brain. The next step is visualizing a shot and then making the swing with eyes still closed. What just occurred is, 100% focus shifted to the right brain by using visual creativity. When students get a hang of that, have them do the same routine but with their eyes open. This is how students train themselves to get into the zone.